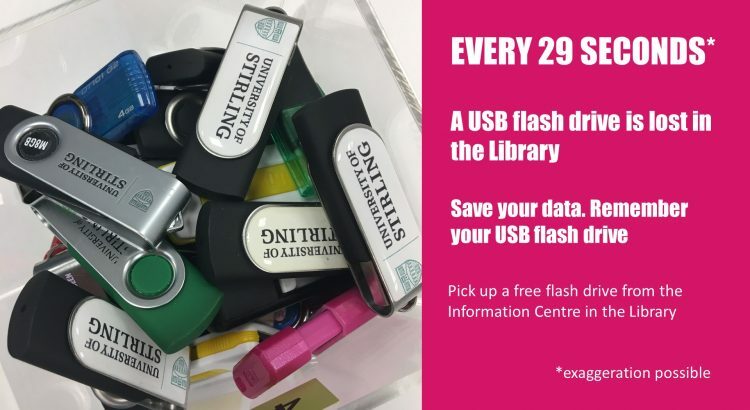 If the number of USB flash drives handed into lost property is anything to go by you have probably lost your flash drive at least once during your time at university. If you leave the flash drive’s cap with your keys, then you will most likely remember to remove it out when you are ready to leave. Some people choose to keep the flash drive attached to their keyring while in use. Some people leave the cap of the flash drive on the desk beside or on top of their mobile phone. Since you are probably not going to leave without this piece of technology, you will notice the cap and remove the flash drive. Another tip would be to just simply write a reminder on a sticky note and place it on the computer screen. It will be staring at you as you prepare to leave. Sometimes a reminder note is the best way to go. Use Box. Box is the university’s cloud-based storage facility. It brings many benefits: easier collaboration, anytime, anywhere, any-device access to documents and unlimited storage space. If you have used several different methods and still find yourself forgetting, you may want to drop by the Information Centre in the Library to pick one up for free. We have a selection of 1GB, 2GB and 4GB+ flash drives available for you to take and keep – you might even be reacquainted with the one you lost! Please note, the flash drives are repurposed from those handed into Lost Property at the university. They have been securely erased and prepared for reuse.